Since then, other parts have been discovered in various places, and have been published from time to time either singly or in groups. The Bodleian has recently digitised all its holdings, which can be seen here. A single volume in the Staatsbibliothek zu Berlin has also been digitised and made available online. I must confess to having been rattled by this, as three of the volumes it reproduces are in Ireland, and I thought I’d taken full stock of what is located in European libraries; now, I had to start again. It is irritating that no details are given as to the precise whereabouts of the volumes, only the countries where they are located. But I suppose this is a little better than the Zhonghua Shuju edition, which gives no details at all. Thus we are told that of the 17 juan reproduced, 2 are in America, 2 in Japan, 5 in England, and 8 in Ireland. Actually the last of these, containing juan 19866, had already been reproduced by Zhonghua Shuju in 1984, but page 8a had been omitted, perhaps because it was accidentally omitted when the photostats were being made in 1931. The Shanghai reproduction makes good that omission. It seems clear to me that the reason why Shanghai Cishu Chubanshe didn’t name the libraries in which these volumes are held is because the images were reproduced without authorisation. This certainly seems to have been the case with the Chester Beatty volumes, as when I visited that library last autumn, the staff there had no knowledge of the reproduction. More serious, however, is how the reproduction was made. Like the Zhonghua Shuju edition, only the text is reproduced, not the matter that appears before and after it. Thus we lose the Siku quanshu forms (see Yongle dadian – 2) as well as any inscriptions and details of provenance. Whether by accident or design, the history of these volumes has been erased. Most recently, the Bodleian has received visits from Li Honglin 李虹霖, Deputy Director of the National Library of China, and Fang Zijin 方自金, Director of the National Library of China Publishing House. Their aim is to produce a full-size facsimile of all extant volumes of Yongle Dadian, and to that end last week we presented them with high-resolution scans of all 19 volumes in our library. As mentioned above, these are already accessible online, and were included in the Zhonghua Shuju’s printed edition in 1960. We still have a copy of the microfilm from which this edition was made. It was produced for us in the 1950s by Oxford University Press, presumably because at that time we didn’t yet have our own filming studio. On Friday 8 July 2011 I moved out of my office in the New Library in Broad Street having worked there since Monday 5 April 1976 sitting at a desk in the same corner of the same room, a continuous occupancy of more than thirty-five years and almost certainly a record. In August 2011 work started on the redevelopment of the New Library into what is now called the Weston Library, and was sufficiently complete to enable me to begin the move to my new office there on Monday 6 October 2014. I suppose it’s doubtful that I’ll occupy my new office for quite as long as I occupied the old one. In the meantime, the special Chinese collections (that is, the materials that are the subject of this blog) were temporarily housed in the basement of the Radcliffe Science Library, and my office was in the Library’s building on Osney Mead. Although this building isn’t in the centre of town, it’s not that far out, and was actually rather pleasant once one had recovered from the shock of working on an industrial estate. I had a beautiful view of the river and its willows from my window, and my commuting time was halved to three minutes and 45 seconds by bicycle. One of the jobs I undertook before moving out of the New Library was to sort out the Oriental Department’s collection of rolls and other oddly shaped material, which was then crammed into a grill on L-floor at the very bottom of the building, three floors below ground level. The collection included a number of Chinese items, some of which I had never seen in over three decades of working with the collection – they were quite literally buried in other things, in dark and dirty conditions. It was then, in the summer of 2010, that I first set eyes on what was then shelfmarked Chin.a.4. 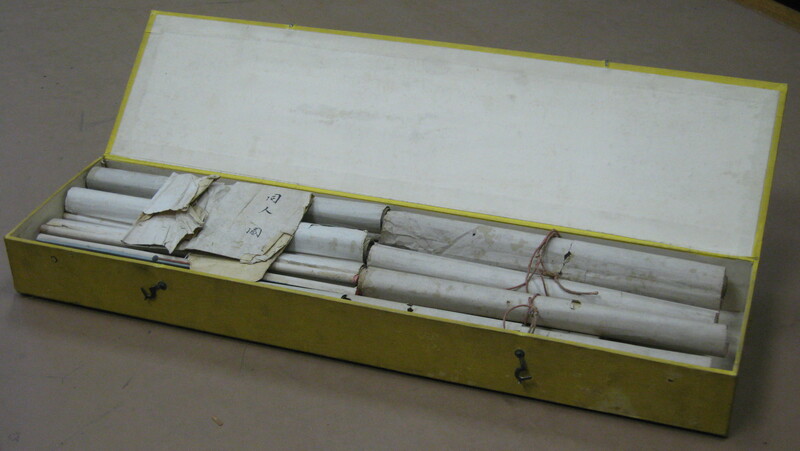 It was a yellow box bearing the words “Chinese anatomical designs”, and containing 12 rolled paper hanging scrolls stamped with the date 24 January 1907, but lacking any indication of provenance. Tucked into the scrolls was a scrap of paper bearing the three characters tongrentu 同人圖 (the first being a simplification of tong 銅), meaning “pictures of the bronze man”. The prototype was a life-sized model kept in the state medical college of the Song Dynasty (Yiguanyuan 醫官院). The model was covered with wax, thus sealing the holes, and was then filled with water. The examiner named a point, and if the candidate located it correctly with his needle, the water would flow out. If he located the hole correctly five consecutive times, he qualified. The model disappeared when the Jin invaders overran Kaifeng – presumably it was looted and destroyed. But during the Ming, which is generally regarded as the heyday of acupuncture, many such figures were created, but not all of them life-size, and many are extant. Huang Longxiang 黄龙祥 and others have argued that the bronze man preserved in the Hermitage at St Petersburg is the only one to have been copied directly from the Song original (see 圣·彼得堡国立艾尔米塔什博物馆藏针灸铜人研究, in 中华医史杂志 35:2(2005:4), 67-73). 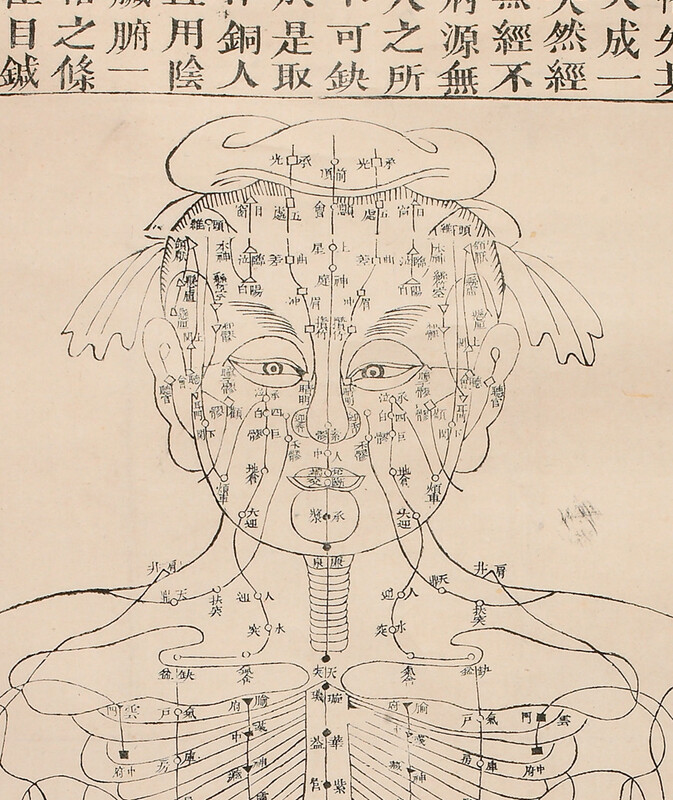 Acupuncture charts are also called mingtangtu 明堂圖, meaning “pictures of the human body”. Needham explains the term mingtang in Celestial lancets (Cambridge, 1980, 100 note c). It originally referred to the ancient imperial cosmic temple or ritual palace, and from the Han onwards its use was extended to the body, and subsequently it appears in the titles of anatomical and physiological writings. This idea of the human body as a temple is, of course, not uniquely Chinese. 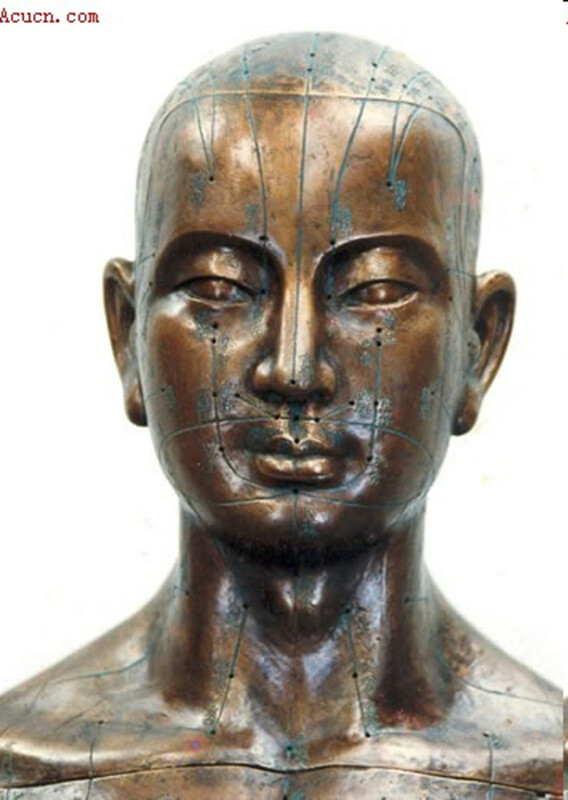 In another work, his compendious two-volume illustrated history of Chinese acupuncture, Huang Longxiang distinguishes two main series of what he calls “mingtang diagrams”, the first being “general diagrams”, and the second “diagrams of acupuncture bronze statues” (中国针灸史图鉴, 青岛出版社, 2003, 上卷:79ff, 200ff). I interpret this to mean that the first series of images is purely theoretical in the sense that from the start, the points and meridians were plotted in two dimensions on paper. The second series, on the other hand, is a two-dimensional expression of points and meridians that were originally plotted on a three-dimensional bronze man. It is clear that of our three sets of charts, two belong to the first series, and one to the second. I’ll call them Series A and Series B. The charts have been scanned, and the links at the shelfmarks give access to these scans. Clearly, they are the same in content and design, but are from different blocks. There is a problem with their attribution to the famous Yuan 元 dynasty physician Hua Shou 滑壽. Huang points out that as there are significant points of divergence from the illustrations in his treatise Shi si jing fa hui 十四經發揮, they cannot possibly have come from his hand. But it is quite possible that Wu Kun 吳崑 was indeed the editor, as the illustrations are close to those in his Zhen jiu liu ji 針灸六集 and the text is mostly accurate. I have found no record of either of these editions in another library. 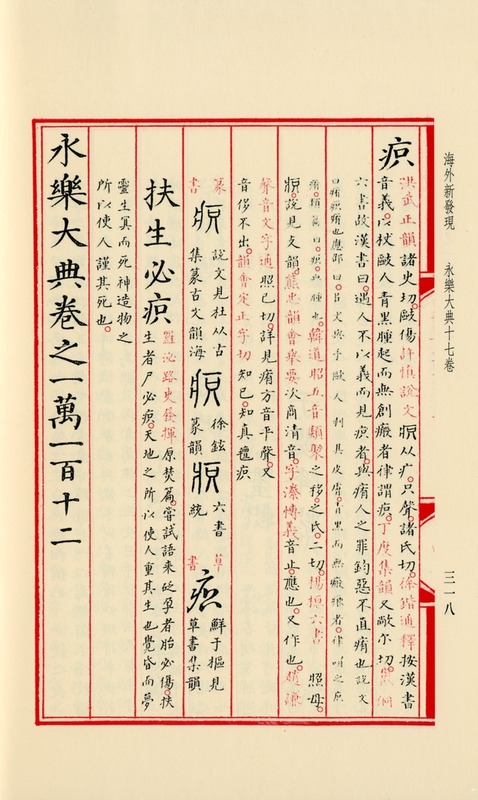 What I thought may have been a copy of the 1782 edition in the National Library of China turned out to be no such thing; it is reproduced in Huang’s book, and although it bears exactly the same imprint and is identical in format, it is clearly from different blocks and the titles of the charts are in seal script, not kaishu 楷書 as in the Bodeian copy. A Google search for the printer “魏玉麟” and “明堂圖” will lead only to the apparently very well-known copy in the National Library of China and to our own, while a search for “鄒啟華” and “明堂圖” will currently lead only to the Bodleian. I can therefore only assume that our copies are either unique, or that others are lying somewhere uncatalogued, or even unnoticed, exactly like ours were for over a century. Actually the first surviving charts to be taken from a bronze man were made by Shi Su 史素 on the basis of charts preserved in Zhenjiangfu 鎮江府 by the Song dynasty physician Shi Zangyong 石藏用. The blocks were cut in 1474 (成化十年） in the Ming medical college. 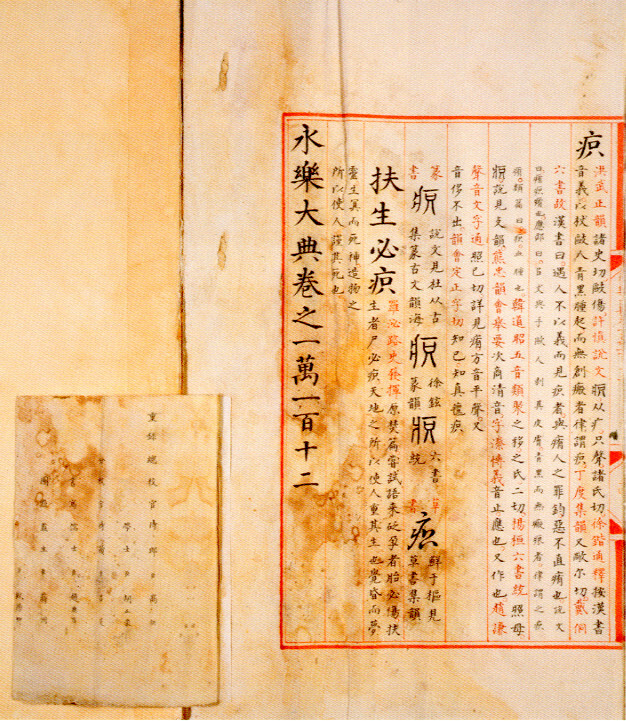 Neither the Song dynasty charts nor the original printing of Shi Su’s charts are extant. 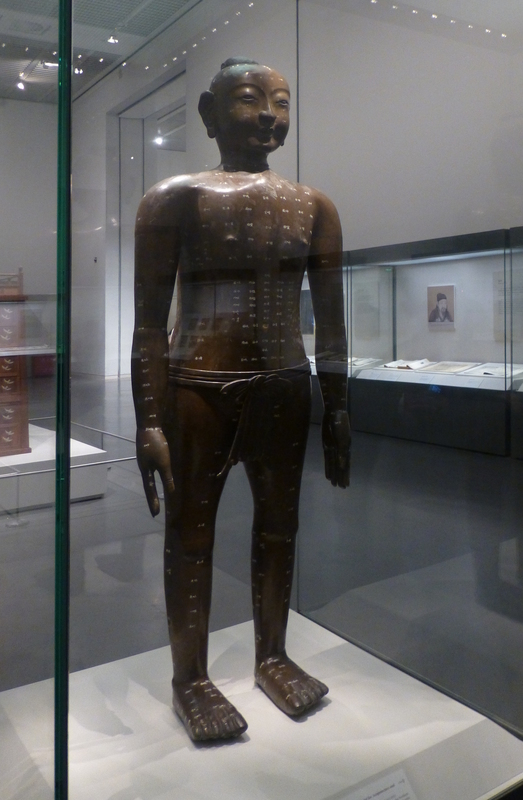 Shi Su’s charts were two in number, the bronze man from the front (正人) and from the back (伏人). Although a manuscript copy of the front view is preserved in Japan, we only have a modern reconstruction of the back view. 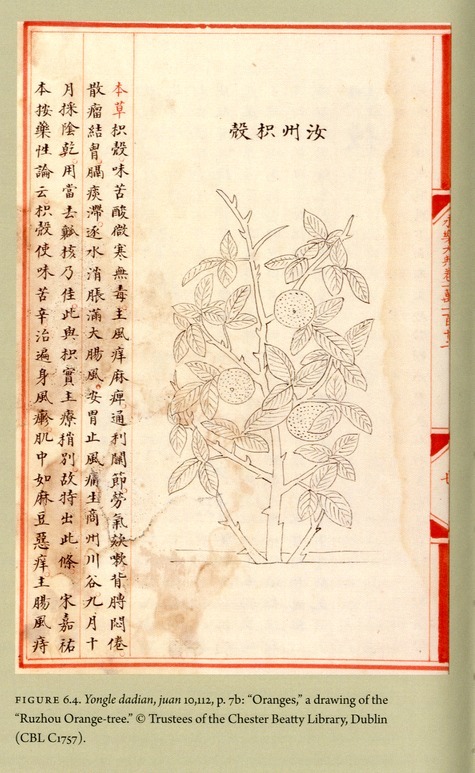 The first charts based on the bronze man in the Ming medical college, of which the Bodleian’s edition is a copy, were made in 1601 (萬曆辛丑) by Zhao Wenbing 趙文炳. Now, to the front and back views are added two side views – really 45° views, one from the front, the other from the back (正側、背側). There are no extant copies of this edition. 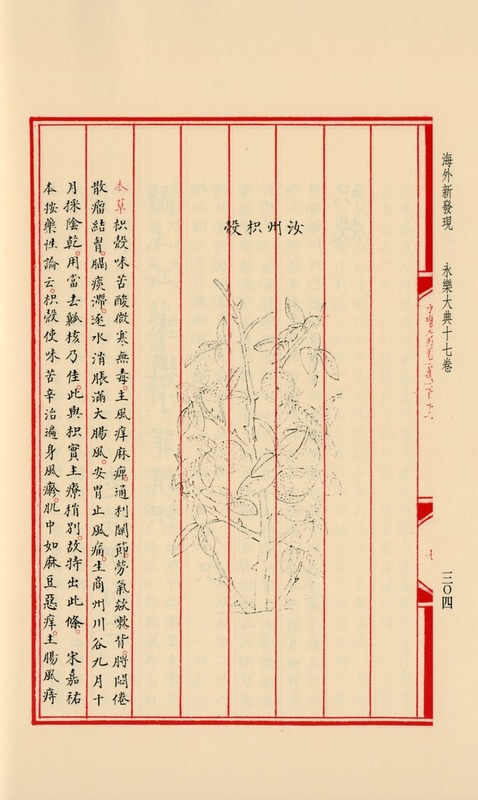 Zhao’s edition was re-cut in 1665 (康熙四年) by Lin Qilong 林起龍, a jinshi 進士 of the Shunzhi 順治 period, and I originally thought that Sinica 6334 might be an example of it. But I had failed to spot (or rather, to realise the significance) of the characters used for expressing the Wanli period (萬歷 for 萬曆). Clearly, our copy cannot have been printed earlier than 1760, when the order was given that the taboo of the characters in the Qianlong 乾隆 emperor’s personal name Hongli 弘曆 might be avoided by the use of homophones. There is actually no extant copy of Lin Qilong’s edition, so that all surviving editions of Zhao Wenbing’s charts, including ours, are re-takes dating from the Qianlong period or later.